This entry was posted in six board chest, stock breakdown and tagged Sapele, six board chest. Bookmark the permalink. 11 Responses to Wood!! Baby! Wow, nice looking planks! How does it work with the plane? I just took the ruff off with my big cambered “boat anchor” jack. 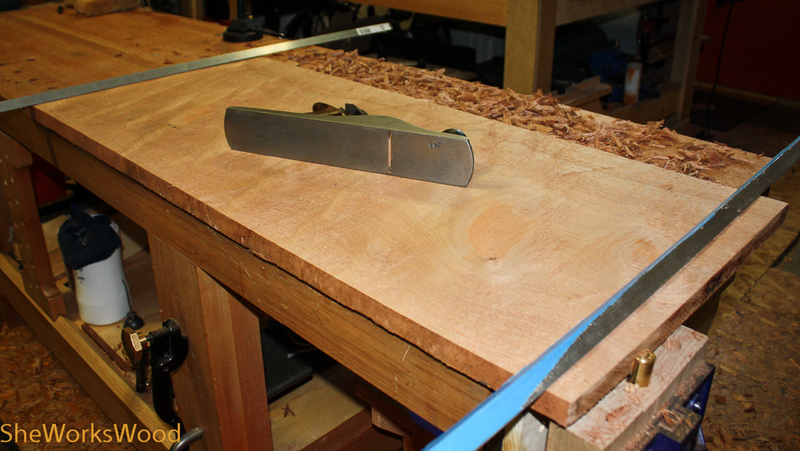 Its tearing out some, but I’m taking pretty good shavings. Tomorrow night I’ll try and smooth it out with my bevel up Jack and maybe a toothing blade. We’ll see what happens when I’m not going cross grain. I’ll be sure to keep it on the DL Marilyn ;D, but in exchange have you talked at all about your bench on bench I noticed in one of the photos?? Thanks Marilyn, but I still don’t find it. 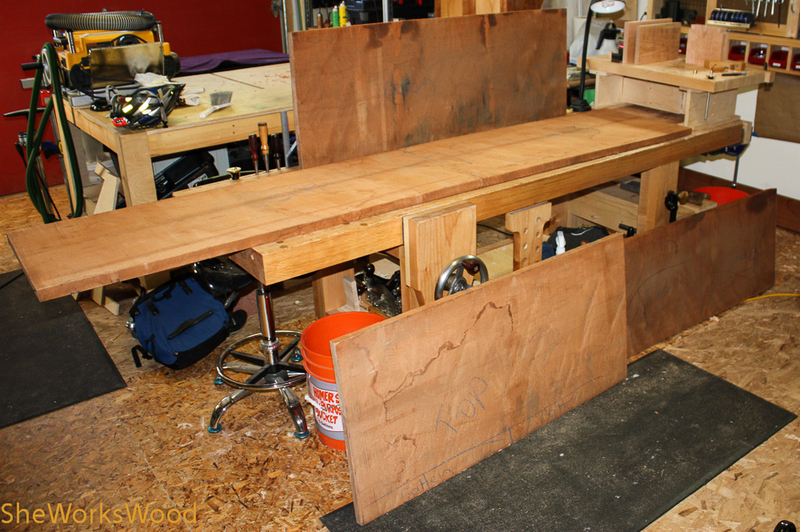 I’m referring to the little sawing workbench you have sitting off to the right, on top of your beautiful Roubo, in the first picture. Whoops! Here’s the only post I did on it. https://sheworkswood.com/2011/02/04/giddy-up-the-saw-bench/ Not really helpful. Shannon talked about it in his first semester. If you have specific questions, I’m happy to try and answer. I might need to go a look at Giddy Up to see how I made it. See .. this is why I have a blog. I can’t remember the details. Thanks! I sent you an email 🙂 I’m slowly learning that blogs help keep track of what you did, but it only works if you post consistently, which is my biggest downfall! !